Your bunny pets can enjoy your produce with you. Whether you are planting now or perusing seed catalogs, take a second to think about your furry babies. They might really enjoy a few things from the garden, too. Raspberries – the leaves are astringent and can tempt a rabbit who is off feed to start eating again. You get to keep the berries for yourself. Parsley – this is a cool weather plant. It’s a biennial, but all you get is seed formation the second year, so we grow it as an annual. Using fresh parsley in your kitchen is a welcome departure from always using dry. There’s a bit of a tang that fresh parsley has that dried never replicates. And rabbits love it. Oregano, basil, lemon balm, and other herbs. Plant the chives for yourself, but most other herbs are enjoyed by rabbits. Basil needs to be pinched down frequently to keep it from going to seed. If you aren’t using the pinchings in your own food that day, your rabbits would be glad to help you out. Mint family herbs can get away from you if you don’t keep after them. Again, rabbits are pleased to eat anything you have to pull up. Carrots. This is a great deal if you live in an area that is conducive to carrot growing. We have clay soil, so it takes a lot of work to get a carrot to grow for us. But we get to keep the carrots and the rabbits will gladly take the tops. Kale and other deep, dark greens. Contrary to what many may think, you should NOT feed rabbits head lettuces. Basically, the lighter in color and the less fiber in a green, the more problematic it is. The darker in color and higher in fiber, the better. Try not to overdo greens, however. 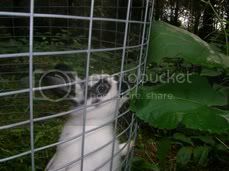 Some contain components such as oxalates that can cause problems with rabbits if you overdo it. Cauliflower, beans, cabbage, potatoes, and rhubarb should all be kept to the human population, as should anything that grows from a bulb. I have used raw sweet potatoes to put weight on rabbits and it works very well. I’ve never had a problem feeding it, but I’ve read that they can block some nutrients. So if I feed sweet potatoes, I use a two weeks on, two weeks off schedule. Yes, the rabbits can help you when you have 18 bushels of tomatoes to get rid of. I’m not sure about the zucchini, though.